FOR anyone who is familiar with Catherine McEvoy’s music it will come as no surprise to learn that she is to receive the Musician of the Year accolade at the upcoming TG4 Gradam Ceoil 2019 in Belfast’s Waterfront Hall. 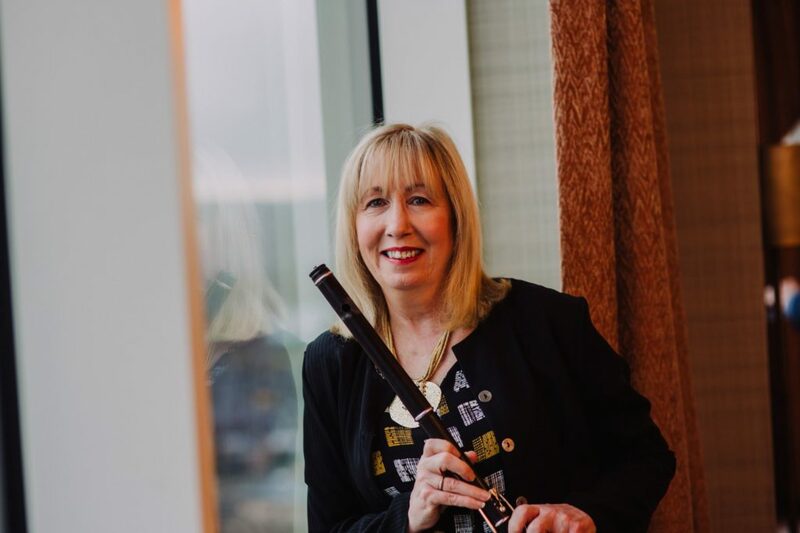 As one of the leading concert flautists in Irish traditional music, recording success, TV and radio appearances and a considerable teaching contribution has marked her distinguished career. While Catherine is no stranger to critical acclaim, she says that she was “completely shocked” by the announcement of the award, which comes at a time in her life when she least expected it. Over the last 28 years Catherine has balanced her own music career alongside a teaching career at St Joseph’s School for Children with Visual Impairment and ChildVision in Dublin. By providing lessons and music therapies to students with multiple disabilities and visual impairment, she gives children a platform for their talents and helps equip them with skills to improve their quality of life. The positive impact of Catherine’s work is undeniable but, admittedly, it allows her little time for her own music. Despite being a professional Catherine says she deals with her hectic schedule by treating her own music as a hobby. “I wouldn’t have loads of time for my own music, but I was never a full-time musician,” she explains. “Music was always a hobby for me. I would do some teaching at home, and I would do the Willie Clancy Summer School, and I would do some stuff in the States too. The funny thing about the trips away is that they’re almost like a holiday. In her family life, Catherine is also surrounded by music. Her husband Tom also plays the flute, while her three grown-up children, Jane, Ruairi and Fergus are accomplished musicians in their own right, but surprisingly, having grown up in Birmingham, Catherine says she herself hadn’t heard Irish traditional music until she was 11-years-old. However, it was in those musically formative years in the city that followed that she picked up the distinctive traditional music style of her parents’ native Roscommon, which she would become renowned for in the years to come. “My dad was more into football and my mum was a good ballad singer, she would’ve sang at parties and that,” she says. “I remember listening to Elvis and Cliff Richards – we had those sort of records in the house when we were very very young, but not particularly traditional music. “It was only later when I was around eleven that I heard traditional music. I thought ‘oh, I like it’. Then my brother was away in boarding school learning classical fiddle and then he got into The Dubliners and started buying their records. That’s when the whole thing took off. “There was a prolific music scene in Birmingham, as there was in London, but it doesn’t get such a high profile. A lot of the big musicians gravitated towards London, but there was still a lot of great musicians in Birmingham, many of them from Roscommon, and there was lot of great musicians passing through. She continued: “A lot of County Roscommon players would travel to Birmingham. One of the first lady flute players I saw play was a woman called Peggy McGrath from County Roscommon and I was really taken with her style – that really spurred me on as well. “The Roscommon style, or the Sligo-Roscommon style, is a rhythmical, flowing sort of style as opposed to what they would call the Northern style,” she explains. Although Catherine says she inherited the Sligo-Roscommon style, she has made it her own indelible skill and fluency. Her recognition as the TG4 Gradam Ceoil 2019 Musician of the Year undoubtedly encompasses a life-time of achievement, but having picked up a serious injury in her hand just over two years ago, she says it comes following a particularly low part of her career. While her musical ability has suffered as result of her injury, in some ways, the award could not have come at a better time. “Two years ago I had a spontaneous rupture in my right hand in part of my tendon, so I’m very lucky that I can still play,” Catherine says. She continued: “It was the biggest shock I ever got in my life. It was massive boost, especially coming from a very low part of my life two or three years ago and sort of clawing my way back. 2019 Gradam recipients, who represent the crème de la crème of traditional music and song, will be joined in live performances on stage by their own special musical guests, including Irish fiddler Paddy Glackin, Michael McCague and multi-instrumentalist Sinéad Egan, to name but a few. A range of VIP guest presenters will also take to the stage; last year, actor Stephen Rea and President Michael D. Higgins were amongst the VIP guests at the event. Tickets for the February 17th TG4 Gradam Ceoil Awards 2019, priced from £22.50, are available from www.waterfront.co.uk or +44(0) 2890 334455.